Heat oven to 375°F. Line cookie sheets with cooking parchment paper or use ungreased cookie sheets. Using 1-tablespoon-size cookie scoop, scoop dough onto cookie sheets 2 inches apart. Bake 12 to 14 minutes or until edges are light golden brown. Cool 5 minutes; remove from cookie sheets to cooling racks. Cool completely. In small microwavable bowl, microwave chocolate chips and butter on High 1 to 1 1/2 minutes, stirring every 30 seconds, until melted and stirred smooth. 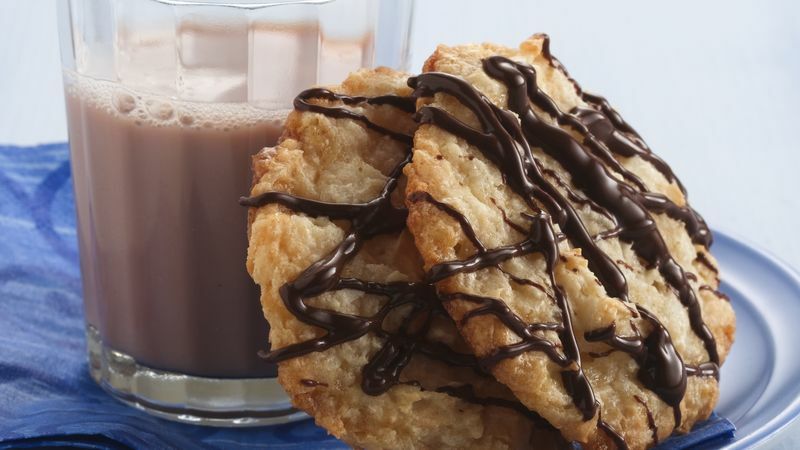 Using fork, drizzle chocolate in lines over cookies. Store loosely covered. Use a #70 (1-tablespoon-size) ice cream scoop to make quick work out of dropping cookie dough. The cookies will be exactly the same size, which means they'll bake for the same time.